Max Joint is a combination of Glucosamine Sulphate, Chondroitin Sulphate and MSM, providing a good source of glycosaminoglycans and sulphur which are important for the growth and maintenance of healthy cartilage and joints. It also contains white willow which is an anti-inflammatory and analgesic herb.Max Joint is beneficial for joint problems such as osteoarthritis, sprains and strains, knee pains or back pain and etc. Glucosamine Sulphate seems to be the most beneficial form of glucosamine as it is the only form shown in clinical trials to be effective for osteoarthritis. Glucosamine is an important building block needed by the body to manufacture glycosaminoglycans, key structural components of cartilage. It helps to stimulate the cells that produce these glycosaminoglycans and normalise cartilage metabolism by inhibiting their breakdown and exerting anti-inflammatory effects. Glucosamine sulphate is used to help the body to repair damaged or eroded cartilage. It has been used to help with osteoarthritis, and acts to improve connective tissue structure in the intestine. The efficacy and tolerance of glucosamine sulphate were investigated in 30 patients with osteoarthritis. The patients were divided into two groups where one group received glucosamine and the other one received placebo for three weeks. Efficacy was tested by semi-quantitative scoring of pain at rest and during active and passive movements, as well as the limitation of articular function, before and after 7 and 21 days of treatment. Patients were positively questioned daily for possible intolerance symptoms. During both initial parenteral treatments, each symptom significantly improved, but to a faster and greater extent in the group treated with glucosamine. A further improvement was recorded in the patients treated with glucosamine during the maintenance period, whereas in the placebo group, the symptom scores increased almost to the pre-treatment level. Clinical and biological tolerances were excellent with both treatments. It is suggested that parental and oral treatment with glucosamine sulphate should be considered as basic therapy for the management of primary or secondary degenerative osteoarthritis disorders. Chondroitin Sulphate is found in the cartilage, bone and connective tissues of most mammals. It is rich in sulphur and consists of repeating chains of molecules called glycosaminoglycans. Numerous clinical studies have demonstrated the efficacy of chondroitin sulphate in osteoarthritis involving the hip, knee and finger joints. In France, the efficacy and tolerability of chondroitin sulphate were studied. A total of 127 patients with mono or bilateral knee osteoarthritis were supplemented with chondroitin sulphate or placebo for three month period. A significant reduction of clinical symptoms was observed in the chondroitin sulphate group, while only a slight reduction was observed in the placebo group. The supplementation of chondroitin sulphate was found to be very well tolerated. The results indicate that chondroitin sulphate favours the improvement of the subjective symptoms, improving the joint mobility. Another controlled, randomized, double-blind study versus placebo was conducted in 104 patients with femorotibial osteoarthritis. After one year of consuming, the functional impairment was reduced by approximately 50% and a significant improvement over placebo for all clinical criteria. Chondroitin was well tolerated by the patients and it acts as structural modulators. Methyl Sulfonyl Methane (MSM) is a naturally occurring, organic, sulphurcontaining compound. It is found throughout nature and has been detected in the blood and urine of humans. A double blind study of its use in degenerative arthritis has been carried out by Lawrence RM. Sixteen patients suffering from degenerative arthritis were evaluated on the effect of using MSM to control their pain. Ten randomly chosen patients were given MSM daily and six received placebo capsules for six weeks. The result indicated 80% improvement in pain on average among the patients receiving MSM, while a minimal improvement in the placebo group. White willow has been used by traditional herbalists for fever, headache, pain and rheumatic complaints. In the late 19th century, the constituent salicylic acid was isolated from white willow bark and went on to become the model for the development of aspirin. White willow is one of the natural sources of aspirin and it has anti-inflammatory and analgesic properties. A German trial assessed the clinical efficacy and tolerability of willow bark extract in patients with osteoarthritis. A total of 78 patients participated the trial with half receiving willow and the other half receiving placebo for two weeks.There was a statistically significant difference in the observed pain dimension and pain score between the supplementation group and the placebo group. The results showed superiority of the willow bark extract over the placebo. It was concluded that the willow bark extract showed a moderate analgesic effect in osteoarthritis and appeared to be well tolerated. A similar study was carried out in Israel to evaluate the effectiveness of willow bark extract for low back pain. A total of 191 patients completed the four weeks study. A number of patients reported pain-free response. It was found that willow bark extract was effective in reducing the exacerbations of low back pain. 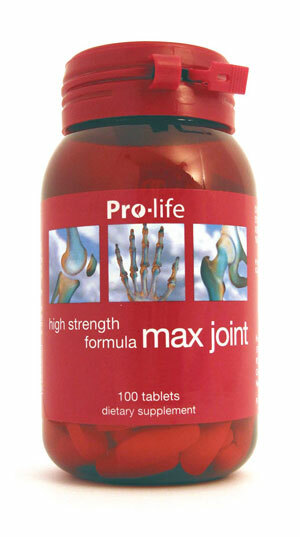 Max Joint has been designed with these potent ingredients that have been clinical studied for the joint functions. Therefore, it is a beneficial supplement for individuals with joint problems.